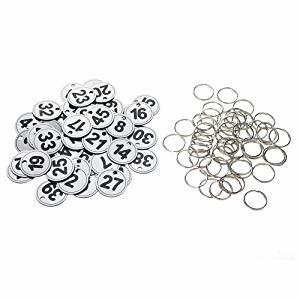 Numbered Tag Size: 1-3/8" DIA. ; Keyring Size: 1" DIA. The key tags and rings are shipped separately. You need to assemble by yourself. Great for assorting keys, cards, bags, luggages, and etc; Great for gyms / sauna rooms / hotels. 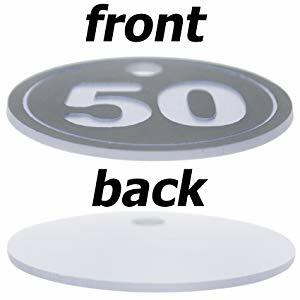 50 sets include 50 number tags and 50 key rings. Count from 1 to 50 and from 51 to 100. Number engraved on one side, the back is plain. The key tags and rings are shipped separately. Need to assemble by yourself. Tag Colors available in Black, Blue, Red, Golden, Silver, Green, Yellow and White. Number Color: Black or White. Identifiable, durable, waterproof and easy to use. 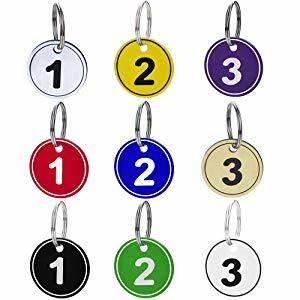 Best solution to distinguish your keys, cards, bags and luggage whilst ensuring them obvious. Suitable for luggages, dormitory / gyms / sauna rooms / hotels, indoor & outdoor lockers and other places. Product was as described. 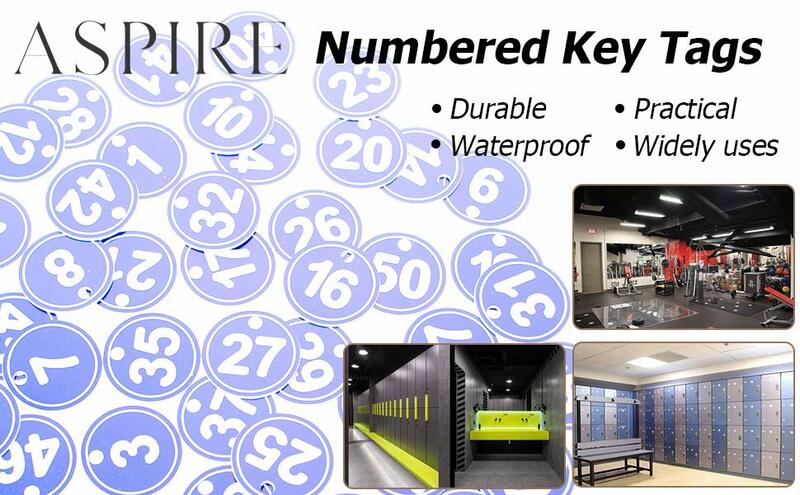 Perfect use for numbering items. I thought the plastic would be a bit thicker. I tore the ring out of one of the tags just by getting it twisted. I glued the tag where it was torn and it's been fine. I gave 4 stars because I wanted them to be thicker, sturdier. Easier to break than what I though it would be. AMKO Displays PT3-Y Yellow Large Price Tags, 1.75" X 2.75"
AMKO Displays PT3-L Lavendar Large Price Tags, 1.75" X 2.75"
AMKO Displays PT3-W White Large Price Tags, 1.75" X 2.75"
AMKO Displays PT3-G Grey Large Price Tags, 1.75" X 2.75"